Shape shifting is an important process for both natural and artificial structures. Animals and plants need to change their shape as a response to environmental stimuli. Some man-made tools also change their shape during the usage. The dissertation focuses on the transformation from 2D sheets to 3D structures. The idea is from origami, an ancient art of paper folding. Various 3D structures can be obtained by folding 2D sheets along pre-designed crease patterns. Besides fabricating 3D structures, origami can be used to design deployable structures and tailor the mechanical behavior of metamaterial structures. In the dissertation, we developed multiple ways to actuate the folding, which are divided into three approaches. In the first approach, folding is achieved via local bending, which is induced by strain gradient across the thickness. Strain gradient can be induced by temperature gradient in a heat shrinkable polymer sheet. It can also be generated by mismatch strain in a bilayer sheet. In the second approach, folding occurs as a result of compressive buckling, which is localized at the creases due to their lower stiffness. In the third approach, folding occurs as a result of changing Gaussian curvature. In all three cases, the driving forces are provided by the heat shrinkable polymer sheet, which shrinks equi-biaxially upon heating above its glass transition temperature. Various 3D origami structures are folded. Its application in crash energy absorber and thermal insulator are demonstrated. Jianxun Cui is from Henan, China. 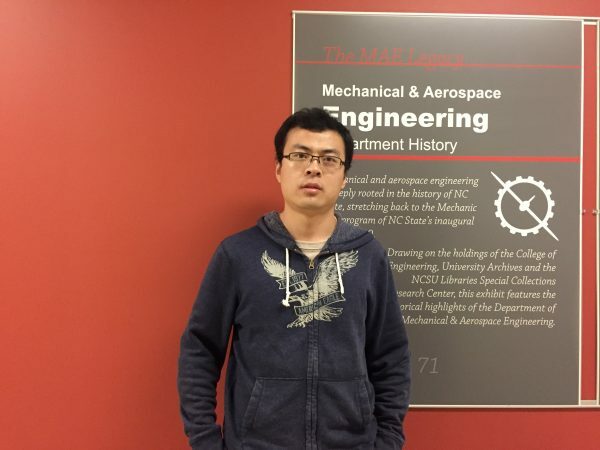 He obtained his Bachelor’s and Master’s degrees in materials science from Harbin Institute of Technology. After that he joined Dr. Yong Zhu’s lab to pursue his PhD degree. He is intrigued by the shape shifting phenomenon in plants and motions in animals. His research is about transformation of 2D sheets into 3D structures and 2D pattern into 3D pattern.